He's been watering seeds of joy for 92 years! I hope you are well and enjoying this last day of summer and feeling deep gratitude for Thay for not only showing us how to transform our suffering but also for watering our seeds of joy and showing us how to do that for ourselves! You can help him celebrate...all the info from the Thich Nhat Hanh Foundation is below. There is also information about the new PV App! Enjoy! We will be gathering Sunday evening at 6 PM at our home (725 Matunuck School House Rd. Wakefield). We will enjoy sitting/waking and sitting meditation. I will offer a short talk and we will share the Dharma. We will be enjoying a fire in the fire pit after our gathering for those who might be able to stay...to enjoy the full moon and take the chill off the first evening of autumn. I hope you will be able to be with us. Saturday, October 6 when we will enjoy the annual RI Community of Mindfulness picnic at Colt State Park in Bristol. Shelter #3 at noon. Please bring a vegetarian dish, your family, your friends, your pets, a song, a poem, a game, an instrument....but most of all your joyful self. It is fun and a wonderful opportunity to meet folks from the other Sanghas that are part of our larger Community. I hope you will be able to join us. Please hold Ann Galkowski, her mother and family in your prayers and in your heart. Please also continue to hold Laura French in your prayers...you can visit or send love in the form of a note to her at 179 fairway Drive, North Kingstown RI 02852.
and to prepare for sky watching tomorrow evening....enjoy! 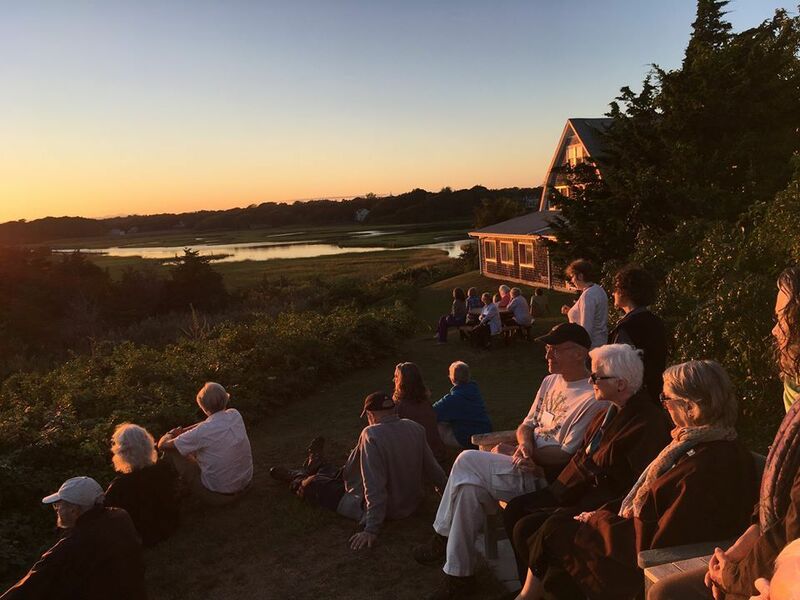 We recently had a retreat on Cape Cod...this photo of our sunset meditation by Ellen Dessloch captured the peace and joy. I wanted to share it with all of you. FROM THE THICH NHAT HANH FOUNDATION...CELEBRATE THAY'S LEGACY (BY OCT 5)...INSTALL THE NEW PV APP! A joyful September to you. Thich Nhat Hanh has told us many times: "My life is my message." As Thay's continuation day approaches, we invite you to join us in our reflections on the impact of his teachings on our own life messages. How have his teachings changed your relationship to peace? How do we continue Thay's legacy? As a novice in Plum Village, I remember Thay sharing the practice of Oui / Merci (Yes / Thank You). This teaching was first given to French children in order to help them recognize and say "yes to the gifts of life. With the practice of Yes / Thank You, we can develop more equanimity, since the mind has been trained in saying “yes” (recognizing and accepting) to what is present. This "yes" is beyond like or dislike, agreeing or disagreeing. There is space, there is ease, and so wellbeing is possible. I have learned so much by observing Thay, to recognize his life as his message. This body teaching also inspires me to ask: What is my message? What do I deeply care about and cherish? Where do I want to invest my time and energy in this life? The practice of Yes/ Thank You helps me open to the conditions and the situation in the present. My response and contribution are where I put my energy and life. The reach of Thay's legacy is immeasurable. We want to collect and archive a visual representation of his legacy, particularly the diverse ways many of us engage in the practice in our lives. Whether your practice involves attending retreats, mindful walking in nature, meeting weekly as a Sangha, or volunteering at a prison, please send us pictures of Thay's legacy manifesting in your own life. Photos submitted by October 5th may be included in a digital photo album to be presented to Thay on his continuation day. Please submit your photos through this form. The Plum Village App is out! The Thich Nhat Hanh Foundation is happy to introduce you to two new members of our Foundation staff. As the Fund Development Associate, Tram Nguyen will be involved in processing and stewarding your gifts, managing our database, and sharing our gratitude with you. She will be based out of our Foundation office at Deer Park Monastery. I f you are there on retreat, please stop by and say hello. Nicole Kramer, our new Communications Coordinator, will continue our efforts to share mindful and meaningful communications to you via our newsletter, website, and social media accounts. She will also coordinate your applications for grant funds through our Dharma Sharing Program. Tram Nguyen, Returning Path of the Heart, was born in Saigon, Vietnam and came to the United States with her family as a refugee when she was 8 years old. Growing up, she moved around with her family many times due to their work. She currently lives in Temecula, California with her parents and her dog, Chewie. Tram was introduced to the Plum Village tradition in 2016. She was fortunate to have the opportunity to live and practice with the brothers and sisters at Magnolia Grove Monastery in Mississippi for seven months in 2017. She is a member of the Wake Up Little Saigon (WULS) Sangha in Orange County and recently started a Teen Sangha with other fellow WULS members. She enjoys being in nature and loves to look at the leaves and hug trees. She also likes to stay active by running, biking, and swimming. Quotes by Thich Nhat Hanh that inspire her: "Mindfulness is a source of happiness" and "Walk as if you are kissing the Earth with your feet. Nicole Paola Kramer, Nourishing Bridge of the Heart, began meditating in Northern California at the age of fourteen. She was most struck by the teaching of interbeing, as explained in Thay’s book “Old Path White Clouds.” She continued to practice across several traditions, reading books, attending retreats and facilitating sanghas in California and New York. In 2015, Nicole visited Thai Plum Village, where her heart burst in awe of monastic life. She now regularly visits Blue Cliff Monastery and is an active member of Wake Up New York. Nicole studied Sociology at Columbia University, working to bridge the University to its surrounding communities and help locals take advantage of University resources. She has worked in communications at several non-profit organizations in the United States and India. She adores teaching high school students, hiking, dancing and singing, and most of all, spending time in community. A quote by Thich Nhat Hanh that inspires her: “You can see everything in the universe in one tangerine." A deep bow of gratitude to you for keeping our practice alive and joyful.